Matthew McConaughey's relatives were convinced the actor's now-wife Camila Alves was preparing to reject his 2011 Christmas proposal because she took her time responding. The Dallas Buyers Club star popped the question to Camila in front of their loved ones over the holidays, but some family members feared the Brazilian beauty's initial silence meant she was going to say no. "I remember hitting the knee, looking into her eyes and... I remember her face," he recalled to Esquire magazine. "I remember this smile coming up from her feet. I remember her having to catch her breath. And she didn't say yes right away. And then the whole family was going, 'Jeezus, she's gonna say no.'" Luckily for Matthew, the designer just needed a moment to accept the surprise proposal. Read more: Matthew McConaughey tells of ‘love at first sight’ when he met wife Camila "The first words out of her mouth were not yes. I'm not gonna say what it was," he smiled. "But I did say, 'Look, I'm down on a knee. I'll stay here awhile. I will outlast you.' And I did! She conceded." Matthew and Camila went on to wed in Austin, Texas in June, 2012, and are now parents to three children: sons Levi, eight, and Livingston, three, and daughter Vida, six. Elsewhere in the new Esquire interview, the 46-year-old reveals he doesn't pay attention to his critics, who have questioned why the Oscar winner is continuing to appear in brooding adverts for Lincoln motors. "F**k that," he responds when asked about the backlash. "Because I'm going to. And I like 'em. And they pay well. And they allow me to go and do these other little movies for a lot less." 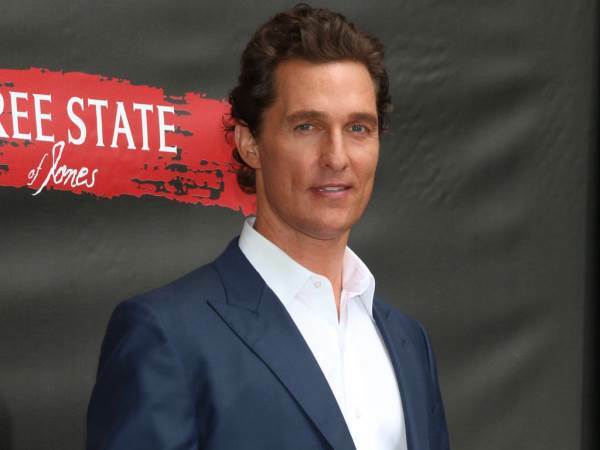 Read more: Matthew McConaughey: Camila’s my dream girl! That freedom has allowed McConaughey to choose a good mix of commercial and independent films in recent years, including 2013 AIDS biopic Dallas Buyers Club, which earned him the Best Actor Academy Award and earned him the long-awaited recognition he craved from his peers because of his unconventional approach to Hollywood. "I didn't grow up acting. I don't enjoy thespian, Hamlet-ian talks (sic)," he explained. "I was the first frat boy in the University of Texas film school who wore button-down denim shirts, boots, and a buckle when all the Gothic artists were all in black. I went to see the big Hollywood pictures at the cineplex that everyone else in film class s**t on." He continued, "For a while I thought maybe you really do need to wear all black and stay out of the sunlight and only see independent films to be an artist. I still have moments with acting where I'm like, 'I'm getting away with it'. Winning the Oscar was validation, the respect of my peers." You may also like: Matthew McConaughey: Camila tamed me!